- Highly experienced consultants who use a holistic approach to determine aspirations and skills to help chart your education and career plans. - Highly personalized experiential teaching methodology with small group size. - Excellent and exhaustive practice material. - Mock test analysis: To review progress, identify problem areas and develop test taking strategy. "I came here for GMAT coaching classes. I particularly wanted help with the verbal section and needless to say, Sameer sir helped me a lot. His techniques and strategies make the concepts rock solid. He was always willing to help me with the doubts which made my sessions even more fruitful. The overall experience was nice and I would recommend it to everyone who wants good coaching for GMAT. " "I have been taking classes for verbal and my experience has been amazing. In the crowd of so many commercialized test prep companies I found this one to be different in terms of their approach. I got personal attention in form of numerous one on one doubt sessions and with clear focus on strategies and concise reading material made the cut. I feel aptitude test prep require a lot of personal attention and this is where this company fills the gap as compared to other test prep providers. " "The biggest issue I was facing in aptitude tests was inconsistency in my verbal scores. Sameer Sir made sure that I don't only perform well on a good day but structured my prep in a manner that I perform well even on an average day under any externally. What set his classes apart for me were the one-on-one question-wise mock analysis, dozens of test day strategies, professional yet noncommercial approach, and a bucket of option elimination techniques for cracking the exam. His persona, full of optimism, patience and honesty is such that the impact is not limited to just the test but goes much beyond it. Thank you Sir for all your efforts. " 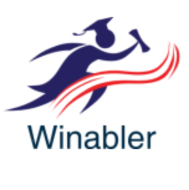 Winabler conducts classes in ACT Exam Coaching, GMAT Coaching and SAT Coaching. It is located in Defence Colony, Delhi. It takes Regular Classes- at the Institute. It has got 3 reviews till now with 100% positive feedback.